Who’d a thunk it, I have belief and trust issues. Me, the psych graduate! Me, the one who teaches you to set goals, know your ideal client. Me! Oh my god! Boy did I get pushed on this in a group coaching session I had last weekend. I didn’t trust that I could run my own business my way. I had bought into the BS and hype as to how I should run my business. I thought I had to make cold phone calls and lead pages. Here’s the thing, I don’t like them and I now trust myself not to do them. That’s it, I DON’T HAVE TO! God that realisation feels good. Oooh, the other thing, I don’t like it when other businesses hide their prices. Guess what? Again, not me and I’m not going to do it. Just because someone else does it, it doesn’t make it right for me; especially if it doesn’t sit well with me. Here’s the other trust shift I had. Niche. I LOVE working with businesses who create. They could be creating health, art, memories. Whatever it is they create, I love the energy which goes into these things and I love the stories behind them. So, I will now trust and honour that. My ideal client associates themselves with being creative. So this trust has created a sense of belief; belief that I truly am where I am meant to be and headed in the right direction. I know that sounds woowoo, guess what – that’s me too. But belief is amazingly important. It’s important to believe in yourself, your business, and your path. Guess what, when you own those beliefs then you have somewhere where you and your customers align. What do you believe? What is true? Have you told your customers that? Have you let them in to your life a little? You know that it doesn’t matter what you do or sell, with every purchase your customers buy a piece of you. You are given this opportunity to connect with them, not just as a transaction level, but a deeper level. They are buying a little piece of you and you need to trust that is part of the transaction. 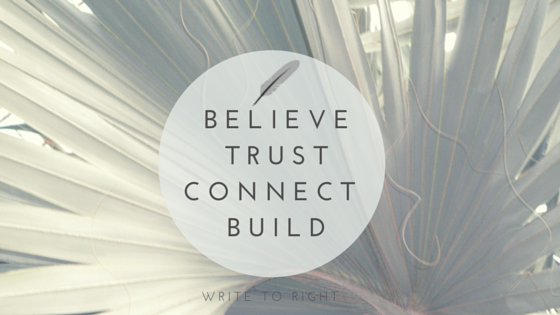 Guess what, when you connect to your client and align your and their beliefs magic happens. You speak their language, you touch their soul, you bring them on your journey. That’s a powerful place to be. 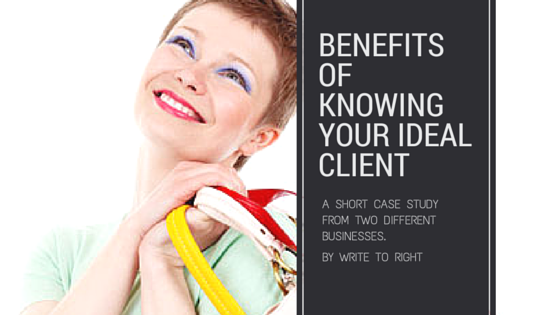 A case study on how businesses benefit from knowing their ideal client. Do you know who your ideal client is? Do you know why you should know them? Do you think it’s something else you need to do? Let me show you how your business can benefit from defining your ideal client. I first became aware of having a definition of an ideal client in the second year of my other business. I had just launched my website and within one week, I had my largest order come through. It was a new customer, they hadn’t ordered through Facebook or seen me at the markets and they ordered hundreds of dollars of hair accessories (yup, that’s my other business). Over time I have chatted with this customer and come to realise that when I focus on her and fixing her needs, I make more sales (not necessarily to her, but other women like her). I found it! I had found my ideal client! I started thinking more about other customers who had made sales easy. Be warned, affluent people aren’t necessarily your ideal client – so don’t just say that you want a rich ‘sugar daddy’ client. I then used this information to build a profile and to use it when talking to customers online and at the markets. I could tell who was ‘just looking’ and who was going to buy from me. I could also then talk to their needs, show them the benefits, and use these to drive sales. It makes things so easy when you know when you are targeting. It also means that you can focus your energy AND you can make bigger sales to fewer clients. So when I do a website audit, I ask, ‘who is your ideal customer’. Could you answer that question if I were to audit your website? I am yet to find a customer who can. Why? Most people say that they just want to sell to anyone. Well that’s fine, but then who are you writing for when you are writing your website or Facebook or newsletter or any communication you have with your customers? You’re writing for your customers. So who are they? How do you know that you aren’t wasting your time? Or, what are you missing out on because you haven’t defined and aren’t targeting your ideal client? A client comes to me for a website audit. They want to increase the number of corporate clients coming through their site. I help them by auditing their site, suggesting keywords to include throughout the site, and then they asked me to make the changes. Guess what?! They are now getting new corporate clients saying they found them via the website. Better still, their ideal client (one they have admired for years) recently placed an order with them. Imagine their excitement when it came through. How did it happen? We added a focus to their site for their ideal client. It would normally take them days of normal trade to make the same money as they did from that one corporate customer. So, have you defined your ideal client? Is your website targeting your ideal client? Is your Facebook page meeting their needs? Contact Write to Right now for a free 30 minute call on how you can improve your online presence. Alright, it gets to the point where a girl has to bust some business beliefs floating around the interwebs. This week, there are a couple of BS posts I want to bust. The first is about blogging and the second about Facebook posts. I call utter BS on this one and I have some good reasons. No two blogs are the same. ‘Well, derr Kara that’s obvious!’ Just hang tight. Consider your favourite subject and how much you would read on that, now consider stuff that you kinda find interesting, like celebrity gossip… So there’s a reason why tabloid posts are short, there’s not much substance to them. However, if it’s a topic which holds your passion you will read and read and read. So I call BS to the ultimate 300, 400, 600 word blog and say – it depends. What I will say is, make sure your blog posts have plenty of white space; so short paragraphs or quotes, or left justifying your text. These things create white space, areas where the eye can rest. Make sure you hook the reader in the first two paragraphs. We scroll down a website, so you will need to engage a reader early to get them to continue to scroll. Make use of the ‘page down’ key when writing your blog. For each press there should be something on the screen which is visually different; be it a picture, quote, a title, or a video. Each of these creates visual interest and encourages scrolling. Ever seen that? You should make sure you are posting at least ‘X’ times a day. What a crock! Sure the more often you post the more likely you are to ‘catch’ your audience, but if you look at your Insights you will be able to see when they are on and target those times. Let’s face it, with all the hats business owners wear; we need to work smarter, not harder! Not all Facebook fans are created equal. What works for a page followed by tweens and teens, won’t necessarily work for a group of middle-aged women, nor will it work for a group of male retirees. Their internet behaviours differ. Not to mention that people get annoyed if they see you ‘clogging up’ their newsfeed. Over the years I have been managing Facebook pages, there is something I have come to understand about the number of posts a page needs. The more people you have following your Facebook page, the more posts you need. (Tweet this) The magic number of how many will depend on your business, the demographic of your fans, and their Facebook behaviours. You can find your specific details in the Insights on your page. The rule of three for business is something I learnt in a “Think on your feet “ course many years ago. The course was designed to help managers and business owners to succinctly sell their team, project, or business in any forum. It was primarily marketed as a formula for elevator pitches. This blog won’t go through the course, but I will teach you my keys to getting to your three words. See, that’s what this is all about, getting you to a point where you can succinctly sell your business from just three words. Primarily, you can use these three words as the prompt for your elevator pitch. Use them to start a conversation, elaborate on them. They are there as a quick take-away for the listener. From the three words, you start a conversation into the who, what, why of your business. It opens up a way to pitch. It gives you the mental prompts to lead the discussion. They can be used as tag-lines or by-lines, in social media descriptions, or at the start of the ‘About’ section of your website. In these places, they also lure your reader in to ask more questions, look deeper, investigate further. Ever gone to a party, networking event, or been asked “So what do you do?” Having a three word elevator pitch is a quick way to answer the question. It’s easy to remember, and you will soon find out if the person was asking to be polite, or if they were genuinely interested. How do I develop one? At the very start, you need to work from your business goals and the definition of your ideal client. Your business goals, explain the ‘why’ behind what you do and the definition of your ideal client is your ‘who’. So, to explain, Write to Right’s tag line is “Empowering businesses online”, my other business is “Stylishly simple hair accessories” (I know four words technically, but I only make hair accessories). So, what’s your tagline or elevator pitch? Leave it in a comment below and link it to your website or social media profile. Struggling to work it out? Have you defined your business goals & ideal client? The Write to Right workbooks are designed to step you through these. Need one-on-one help, then contact me to discuss how I can help.